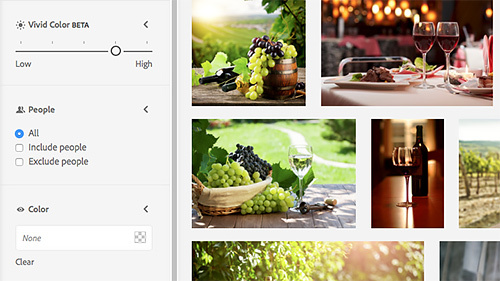 Adobe announced several new partnerships that will greatly expand what's available in Adobe Stock collections. At the same time, the company showed off two new search techniques based on Adobe Sensei. Depth of Field. One of two new aesthetic filters. We recently attended a briefing with the company in which they demoed the new capabilities. Reuters will bring its news, sports and entertainment collection of 12 million editorial images and 300,000 video clips to Adobe Stock. It is live today. USA Today will soon bring it 10,000 events a year and 500,000 images a year to Adobe Stock. Stocksy has added its 400,000 royalty-free stock photos to the collection today. A Depth of Field slider to narrow finds down to more or less depth of field. A Vivid Color slider to narrow finds down to more or less saturation. The sliders can be used in combination with a text search or independently of one. 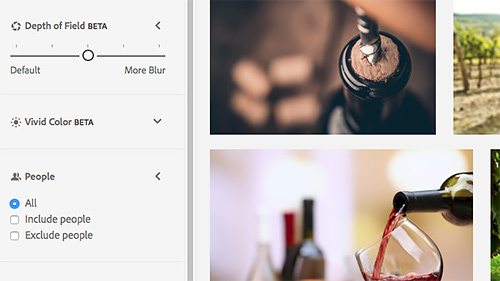 And they will be available wherever you can access Adobe Stock, including with a new PowerPoint plug-in, although the filters are not yet available in Photoshop. Vivid Color. Narrows the set based on saturation. The company also said it plans to educate Microsoft customers using PowerPoint about the legal restrictions of using stock imagery. Adobe said it has built a dedicated tam of search scientists working on Sensei to develop these filters. Additional filters will be added over time, they noted. Facial recognition, however, isn't in the plans, Adobe confirmed. It requires "a different skill set." Another filter, particularly important for news photographs, that is not yet available is Date. You might, for example, want an image of a specific sports figure but only at a specific event. That one is coming soon, Adobe said.